Having a boyfriend is like having a second, annoying child. No offence, guys. But men can really be babies at times. They just don’t understand some things, and it can be almost impossible to make them understand. However, husbands are on a whole new level. You have to deal with them no matter what, and they can behave hilarious at times. But when are they the weirdest? It’s when they’re sick. Women on Twitter tweeted about how men behave when they’re ill, and it’s the most hilarious thing you’ll read today. 1. I feel you, sis. 2. Husband vs. Wife when sick. 6. I hope she feels better. 9. I hope he doesn’t die. 11. Man dying or real dying? 13. Pregnancy or cold; which is worse? 14. I meant what I said. 15. On the market again. 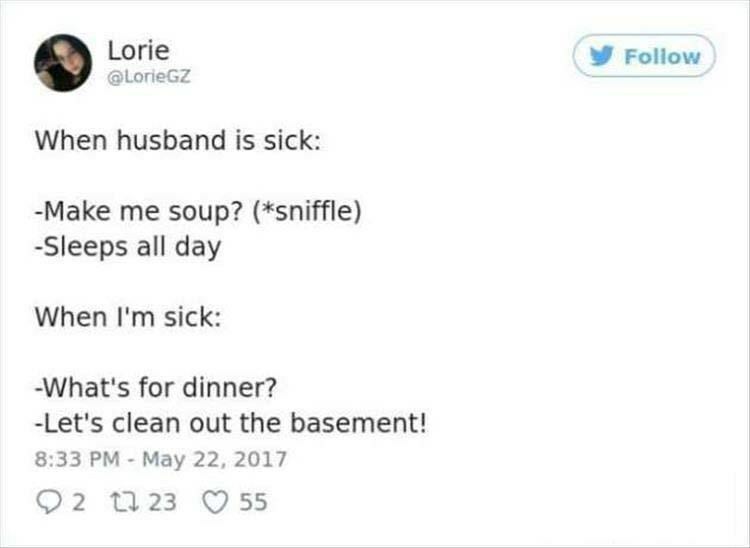 How does your husband behave when he’s sick? Let us know in the comments below!